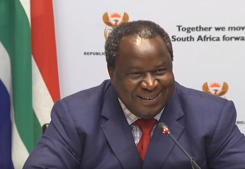 The Minister of Finance, Tito Mboweni, says they will hold discussions with the South African Broadcasting Corporation (SABC) on how to rationalise the structure of the public broadcaster. Mboweni addressed the media yesterday ahead of his maiden budget speech. The SABC has been facing financial challenges for several years. “SABC say they need R6.8 billion so the DG is having conversations with the SABC to see what they are going to do. But my basic view is that if we have to make allocations for these state-owned enterprises we must know that something else must give. If R6.8 billion must go to the SABC, R6.8 billion must come off another budget item. But should we agree to make available R6.8 billion, you can be rest assured out Chief Restructuring Officer will be at Auckland Park. There is no question of giving money without supervision. Those days are over. My advice to them, avoid the national treasury, do your job appropriately,” says Mboweni. The post Mboweni to hold structural discussions with SABC appeared first on SABC News – Breaking news, special reports, world, business, sport coverage of all South African current events. Africa's news leader..
NEXT POST Next post: Could Lagerfeld’s cat Choupette inherit his millions?